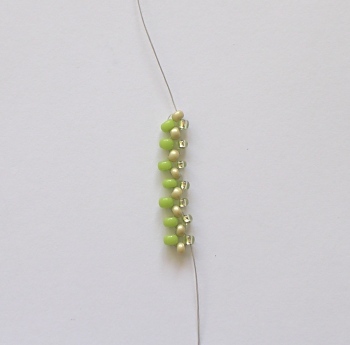 This series of beadwork shows just how much something can vary from the original idea or aim. I began this just after doing a Right-Angle Weave (RAW) class with David Chatt. I can home having re-affirmed my love of RAW and eager to do some work with it. I was intrigued with the idea of making 3d structures. So out came my beads, I beaded one row of RAW, pondered joining it into a circle and that was it- my Honeycomb Beadwork series was begun. The name of the series came from the fact that the motifs used are six-sided. Instructions for the pieces in this series are contained within my Honeycomb Beadwork instructions.